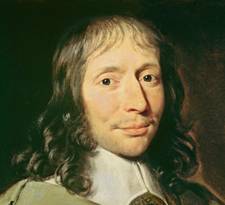 Blaise Pascal was a French philosopher, physicist, and of course mathematician. Pascal demonstrated his abilities at a very early age, under the guidance of his father, but lived a short life (he died at age 39). Controversy seemed to follow Pascal throughout his life. For instance, Pascal offered a prize for a mathematical contest he proposed. However, Pascal entered under an alias and crowned himself the winner. If you have heard of Blaise Pascal it is probably because of Pascal's Triangle. There are countless patterns you can uncover by looking at Pascal's triangle. Which patterns can you find? And if you like patterns, take a look at Fibonacci. Return from Blaise Pascal to other Famous Math People.